Can Employers Transfer a Pregnant Employee to Another Position? The Pregnancy Discrimination Act of 1978 (PDA) protects women from discrimination on the basis of pregnancy, childbirth, and related medical conditions. Under the PDA, employers must treat pregnant employees the same for all employment-related purposes as non-pregnant employees who are similar in their ability or inability to work. This means that if a pregnant employee is able to work, she must be allowed to work under the same conditions as non-pregnant employees. This is inclusive when am employer is deciding to transfer a pregnant employee to another job. Under the PDA, as explained by the U.S. Supreme Court in International Union, UAW v. Johnson Controls, Inc., 499 U.S. 187 (1991), employers are no longer “permitted to force women who become pregnant to stop working regardless of their ability to continue”. Having long represented victims of pregnancy discrimination, our Alachua County, Florida pregnancy discrimination lawyers have learned that employers frequently transfer pregnant employees to less favorable positions because of purported health concerns for the mother and unborn child. However, the Johnson Controls Court held that an employer’s safety concerns constitute a permissible basis for an employment decision adversely affecting a pregnant employee only where her pregnancy “actually interfered with the employee’s ability to perform the job.” The decision by the U.S. Sixth Circuit Court of Appeals in Spees v. James Marine, Inc., 617 F.3d 380 (6th Cir. 2010) is instructive in showing that transferring a pregnant employee to a less favorable position because of alleged safety concerns violates the PDA unless the employer has a meritorious factual basis for believing that her pregnancy prevents her from safely performing the duties of the position. In that case, Heather Spees (Spees) claimed that her former employer, James Marine, Inc. (JMI), transferred her to a less favorable position because of her pregnancy in violation of the PDA. JMI constructs deck and tank barges, towboats, and dry docks for the river-shipping industry. Spees was employed by JMI as a welder. Spees’ work as a welder involved heavy lifting, climbing up ladders and stairs, and overhand handling of equipment. 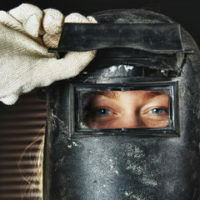 As a welder, Spees was also exposed to fumes, dust, and organic vapors during the course of her work. Shortly after she started working at JMI as a welder, Spees became pregnant. When Spees expressed concerns to her foreman, Milam, that she would be fired because of her pregnancy, Milam responded by saying he “had concerns about her being around the chemicals, the welding smoke, and climbing around one some of the jobs” while pregnant. Milam told Spees to see a doctor to “find out exactly what she did or didn’t need to be doing or around.” The next day, Spees had an appointment with her doctor. Spees’ doctor told her “there was no problem” with working as a welder while pregnant and gave Spees a “Certificate to Return to Work” stating there were no restrictions on her ability to weld. While returning to work after her doctor’s appointment, Spees called Miram and informed him that she had received clearance from her doctor to work as a welder. Milam then had Spees read him the doctor’s “Certificate to Return to Work.” Although Spees was medically cleared to work as a welder while pregnant, Milam believed, based on “common sense,” that “there was some questions about her being pregnant and being able to safely perform the job that she was required to do.” Milam eventually told Spees that he had consulted with his supervisor, Colbert, and they decided that Spees could no longer weld. Milam told Spees that she could accept a transfer to a position in the tool room. Milam further told Spees that the transfer would be temporary and Spees could resume welding after her pregnancy. Although she told Milam that she wanted to continue welding, Spees accepted the transfer to a position in the tool room. Ultimately, Spees missed some fourteen days of work because of pregnancy-related medical complications. Because she was entitled to only ten days of approved leave and was not eligible for leave under the Family Medical Leave Act, JMI terminated Spees’ employment. Spees’ termination paperwork stated that the company would rehire her after the baby was born. The trial court dismissed Spees’ pregnancy discrimination claim. In doing so, the trial court found that Spees’ transfer to the tool room did not constitute an adverse employment action under the PDA. On appeal, the Sixth Circuit reversed the trial court’s dismissal and reinstated Spees’ pregnancy discrimination claim. Based in Ocala, Florida and representing employees throughout Central Florida, we represent employees who have been subjected to employment discrimination, including pregnancy discrimination. If you have been the victim of pregnancy discrimination or have questions about an employer making employment decisions out of concern for your pregnancy, please contact our office for a free consultation with our Alachua County, Florida pregnancy discrimination attorneys. Our employee rights law firm takes pregnancy discrimination cases on a contingency fee basis. This means that there are no attorney’s fees incurred unless there is a recovery and our attorney’s fees come solely from the monetary award that you recover.